This superb 86cm wide induction hob from Whirlpool boasts four heat zones. Featuring FlexiFull technology, pots and pans can be freely moved around the surface of the hob. With touch controls, residual heat indicators and automatic functions it's great for any cook! Finished in black glass it will really make an impact in the kitchen. What a way to make an impact! This fantastic induction hob from CDA not only offers features such as flexible zones, which you can combine to create larger cooking areas, but looks amazing as well with the distinctive LED strip. Touch controls provide precise control and the automatic pan detection means that you will save money as heat is only transfered directly to the pan as it is detected. 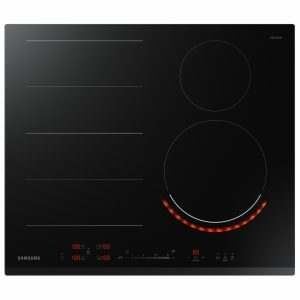 With 4 heat zones and the option to combine 2 zones into a larger flex zone, this fantastic 60cm induction hob from Samsung offers great performance with sleek, modern style. Sliding controls and LED displays make it a breeze to use and with automatic pan detection you know that each zone will only heat when a pan is detected - incredibly efficient! This superb 90cm wide induction hob from Caple will transform your cooking experience thanks to its flexibility. Not only are there eight cooking zones with individual programmable timers, zones can be automatically linked together when using a rectangular griddle or fish kettle to ensure that heat is distributed evenly. With 14 power levels and a boost function on all eight zones you'll have full control when entertaining friends for dinner. 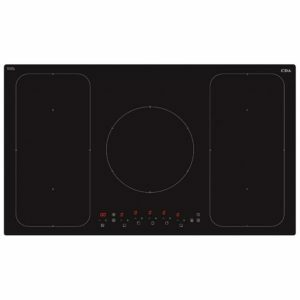 This model was recently recognised as one of 'the best induction hobs' by the Telegraph. Boasting four heat zones, this 80cm wide induction hob from De Dietrich really packs a punch when it comes to performance. 20 power levels and a boost function means that every meal can be cooked perfectly. With auto pan detection there is no loss of heat as the hob will only transfer energy as the pan is detected - clever and economical! In black glass and with touch controls it offers modern and stylish looks to match. 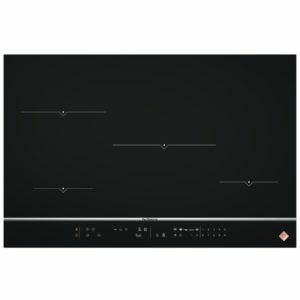 This stunning, frameless 90cm induction hob by CDA looks amazing finished in black glass. But not just a pretty face, it is packed with features to make cooking efficient and economical. With six induction zones and bridging options, it provides brilliant flexibility. LED displays and touch controls make the hob easy to use and as heat is only applied to the pan as it is detected it never stays needlessly on. With functions including simmer, keep warm and overflow detection it never ceases to amaze. Cook up a storm with the Siemens EU631FEB1E induction hob. Featuring 4 zones with automatic pan recognition, only the base of the pan is heated, meaning you won't ever use any more energy than you need! It has electronic touch controls, 17 power levels and a timer on each zone and thanks to the quickstart function you'll be ready to cook in no time. This model is finished in black ceramic glass with a bevelled front edge and would create a fantastic streamlined look to your kitchen. With a stylish black glass finish and loaded with features this 60cm induction hob from Smeg looks amazing and takes the hassle out of cooking. Boasting four powerful induction zones, nine power levels and automatic pan recognition you get amazing performance with efficiency. Perfect for great meals and saving pennies! 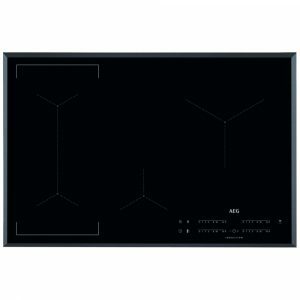 This superb 78cm wide MaxiSense induction hob from AEG boasts four heat zones. It is finished in black glass with bevelled edges. This stunning, frameless 90cm induction hob by CDA looks amazing finished in black glass. But not just a pretty face, it is packed with features to make cooking efficient and economical. With five induction zones and the option to combine the side zones into larger cooking areas, it provides brilliant flexibility. Perfect for those large pans or dinner parties! LED displays and touch controls make the hob easy to use and as heat is only applied to the pan as it is detected it never stays needlessly on. With functions including simmer, keep warm and overflow detection it never ceases to amaze. 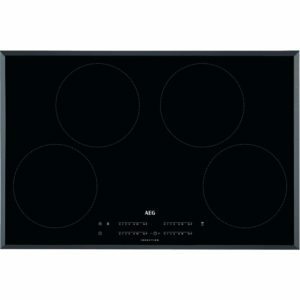 This superb 78cm wide induction hob from AEG boasts four heat zones. There's no more waiting around for pots to boil, the PowerBoost button gives you an instant burst of heat that boils water in under 90 seconds, even faster than an electric kettle! It's perfect for tasks like boiling potatoes, and other quick cooking jobs too, like searing meat. Finished in black glass with bevelled edges it will look great in any kitchen.